Who wants to spend their free time mowing the grass or pulling those nasty weeds in your yard? Also, who could stand doing it in this horrible heatwave! Let’s face is – fact is, lawncare has to be done. 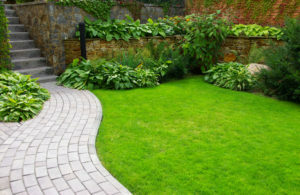 So, as a Landlord you need to think about how to make your landscaping and lawn maintenance as easy as possible. Do you hire someone or have the tenant do it themselves? The below low-maintenance landscaping tips should help you moving forward with ideas to keep your Oklahoma City rental looking nice. In the Oklahoma City area, the most common lawn grasses are St. Augustine, ‘Common’ Bermuda Grass, ‘Celebration’ Bermuda Grass, Zoysia Grass, and Buffalo Grass. Each of these comes with certain advantages and disadvantages. For example, St. Augustine does well in a lot of sunlight, but it also requires a lot of water to maintain. If you live anywhere that imposes frequent water restrictions, this might be a concern. Figure out which grass will best suit your OKC real estate management needs. If grass is too much upkeep for you, you can use mulch or stones in an outdoor area instead. The bonus of mulch is you don’t have to mow it, water it, or fertilize it, and it smells and looks nice. Stones are also a great option if you pick the kind that is durable in any weather. Stones can give your yard that extra touch of uniqueness, and also provide an extra place in the yard to place patio furniture. Before purchasing flowers, be sure you know when they will bloom. Bottlebrush plants are a good choice because they bloom over a long summer season and add that touch of bright red to your greenery. Another great flower that would spruce up any OKC real estate management property is lavender. Lavender smells wonderful, is a natural bug repellent, and doesn’t need to be constantly watered. Planting low maintenance flowers is a great way to spruce up your yard and save time in the long run. In addition to these ideas, Oklahoma City landlords can add potted plants, create an outdoor living space, or collect rain with water barrels for a low maintenance yard. Real Property Management Enterprises will help you with your Low-Maintenance Summer Landscaping Tips and be able to handle any issues you might have with maintaining your OKC rental.